Celebrating Winckelmann: Father of Modern Archeology, Inside the Vatican, March. "Celebrating Winckelmann and Europe's Oldest Museum", La Voce di New York, February. "Paul Stradner: Tra i bistellati più giovani della Germania", La Madia Travelffood, dicembre. "A French Oasis in Baden-Baden with One Michelin Star, Epicurean-Traveler.com, October. 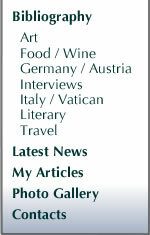 "Arnold Pannartz and Konrad Sweynheim: Bringing Gutenberg to Italy", German Life, April/May. "Paul Stradner: One of the Youngest Chefs in Germany to Earn 2 Michelin Stars, Epicurean-Traveler, September. "The First Four Books Printed in Italy", Inside the Vatican, October. "Soeren Anders: The youngest German Chef Awarded a Michelin Star", Epicurean-Traveler, September. "Hildesheim's Medieval Church Treasures at the Metropolitan", inside the Vatican, November. "The Sistine Madonna: Raphael's Iconic Painting Turns 500 (1512-2012)", Inside the Vatican, June/July. "The 'Benediktweg'-In the Footsteps of Pope Benedict XVI from Baptism to Ordination", German Life, April/May. "Tantris: il tempio gastronomico di Monaco (Bavaria), La Madia Travelfood, gennaio/febbraio. "The Benediktweg and Sltoetting, the "Bavarian National Shrine", Inside the Vatican, October. "Stephan Geisel: Esperto di vino (non della birra) a Monaco di Baviera", La Madia Travelfood, aprile. "Alfons Schuhbeck: Celebrity Chef, Restaurateur, Author, and Businessman", Epicurean-Traveler.com, November. "A Home for a Perfect Pair-Munich's Beer-and-Oktoberfest Museum", German Life, October/November. "Beer, Oktoberfest, and Its Museum", Epicurean-Traveler.com, September. "The Geisel Family: Munich's Best Hosts", Epicurean-Traveler.com, September. "When in Trier...", German Life, October/November. "Melk Abbey: A Micorcosm of Austrian History", German Life, June/July. "Sachertorte and its Namesake Hotel", German Life, February/March. "Constantine in Trier", Inside the Vatican, October. "Ewald e Mario Plachutta: a Vienna gli imperatori del manzo", La Madia Travelfood, October. "Egypt on the Danube", KMT, Summer. "Buon Compleanno Dresda", La Madia Travelfood, March. "German Chocolate - Cologne's Imhoff-Stollwerck Chocolate Museum ", German Life, February/March 2006. "Dresden--Reborn and Still Soaring", German Life, December/January 2006. "Aufwiedersehen Writer's Block", Around the World Radio, August 11. "Pope Benedict XVI's Travels", Around the World Radio.com, August 11. "And the Word Became...Print", Inside the Vatican, August/September. "Ein bier, bitte", la Madia Travelfood, May 2005. "Ancient Egypt in 'Little Paris'", KMT, Summer 2005. "Why 'Benedict'? ", Inside the Vatican, May 2005. "Heidelberg: Where Mark Twain Overcame Writer's Block", German Life, June/July 2005. "Joseph Cardinal Ratzinger: Becomes Pope Benedict XVI", German Life, June/July 2005. "Germany's Fairy Tale Road", Around the World Radio.com, April 25, 2005. "Host of Cologne's World Youth Day 2005", Inside the Vatican, April 2005. "Elmar Theodor Maeder; Commander of the Guard", Inside the Vatican, March 2005. "Pickled in Germany's 'Green Venice'", German Life, February/March 2005. "Unique to Leipzig", Around the World Radio.com, January 7, 2005. "Eyeglass Museums", Around the World Radio.com, December 8, 2004. "Heidelberg: Where Mark Twain Overcame Writer's Block", Bookdealer, September 16, 2004. "Heidelberg: 'In the Footsteps of Mark Twain' and Much More", Epicurean Traveler, September. "Mark Twain's Writer's Block: Postcard from Heidelberg, Germany", Poets and Writers, August 30, 2004. "Monte Cassino Sixty Years Later", Inside the Vatican, August 2004. "Heinz Beck: Rome's Best Chef", German Life, February/March 2004. "Literary Leipzig-City of the 'Black Art'", German Life, February/March 2004. "Beck on Pasta", Epicurean Traveler, December 2003. "The Swiss Guard", German Life, December 2003/January 2004. "Joy of Chocolate", Travel World International, July/August 2003. "Intervista a Heinz Beck", La Madia Travelfood, June 2003. "Heinz Beck: La Pergola Restaurant, The Magician of Balanced Flavors", Epicurean Traveler, May/June 2003. "Along the Märchenstrasse: Germany's Fairy-Tale Road", Epicurean Traveler, February 2003. "Leipzig is Back", Europe, November 2002. "Leipzig: Place at the Limes", Epicurean Traveler, September 2002. "Germany's Fairy-Tale Road", The World & I, September 2002. "15 Fascinating Facts: Leipzig, Germany", Hemispheres, February 2002. "Leipzig: A City Devoted to Letters, Song and the Coffee Bean", Travel World International, January/February 2002. "Along the Märchenstrasse: Germany's Fairy-Tale Road", Antiquarian Book Monthly, December 2001. "Literary Leipzig: City of the Black Art since 1481", Antiquarian Book Monthly, November 2001. "Travels to Italy: A Passion Five Centuries Long", Antiquarian Book Monthly, July 2001. "Gutenberg: man of the Millennium", Antiquarian Book Monthly, June 2000. "Bravo for Bach! ", Oryx, March/April 2000. "Rome's Caffè Greco: Italy's Oldest Coffeehouse", Book, March/April 2000. "Gutenberg: Man of the Millennium", Golden Falcon, February 2000. "Back to Bach and books", Qantas: The Australian Way, February 2000. "Rome's Caffè Greco at Risk? ", Antiquarian Book Monthly, August/September 1999. "Eyeglasses Yesterday and Today", Antiquarian Book Monthly, December 1997. "Clocks: Machines for Measuring Time", Golden Falcon, September 1997. "Gutenberg and Rome", Antiquarian Book Monthly, May 1997. "Ellis Island: Gateway to America", Golden Falcon, April 1997. "The Joy of Chocolate", Golden Falcon, December 1996. "The Vision Splendid", The Australian Way, November 1996. "Gutenberg Mechanises the Word and a Revolution in Learning Unfolds", Golden Falcon, October 1996. "Welcome to America", The Australian Way, September 1996. "Eyeglasses: Yesterday and Today", Golden Falcon, April 1995. "The Pope's bodyguards", Our Sunday Visitor, October 10, 1993. "Time and Victorian Prudery Fail to Declaw a Rascally Master Cat", The New York Observer, Jul 27-Aug 3, 1992. "Eyeglasses Yesterday and Today", Wilson Library Bulletin, March 1992. "Ellis Island", Messenger of St. Anthony, March 1992. "Encounter with tears", The European, November 15-17, 1991. "The Celts: The First Europeans", Wilson Library Bulletin, October 1991. "The Celts: the first Europeans", Messenger of St. Anthony, September 1991. "Venetian celebration of the first Europeans", The European, March 15-17, 1991. "Libro '86: A Bibliophile's Minestrone", American Book Collector, February 1987. "Small But Beautiful: The 1986 Book Fair", American Book Collector, December 1986. "International Rare Book Fair in Venice", Wilson Library Bulletin, December 1986.